You are hereby summoned to the Ordinary Meeting of the Parish Council which will be held in the Village Hall on Thursday 27 September 2018 at 7.30pm for the purpose of transacting the business below. Members of the public are welcome to attend and may address the Council, during the Public Participation Session, Item 5 on the agenda. Except where members of the public have been excluded due to the confidential nature of the business, any person may film, photograph, audio record or use social media to report on meetings of the Council, including any public comment and/or questions. Would any person intending to report please give notice before the start of the meeting to the Clerk or Chairman of the Council to enable reasonable facilities to be afforded. 1. To receive any apologies for absence. 2. To receive, from Members, any declarations of interest in items on the agenda in accordance with the Council’s Code of Conduct. 3. To approve the minutes of the Annual Meeting of the Parish Council held on 27 July 2018. 4. Public Participation Session: including Suffolk County Councillor and Babergh District Councillor Reports. (15 minutes). Clerk to update the meeting on the progress on the annual external Audit undertaken by FPK Littlejohn LLP. DC/18/03871 – Application for Planning Permission, Householder Application – Erection of 2m high fence to front boundary, Mill Farm, Lavenham Road, Cockfield, Bury St Edmunds Suffolk IP30 0HX. DC/18/03180 – Outline Planning Application (All matters reserved). Erection of up to 5 No. dwellings. High Meadows Farm, Felsham Road, Cockfield. IP30 0HW. The Parish Council objects to Outline Planning Application DC/18/03180 for the ‘Erection of up to 5 No. dwellings at High Meadows Farm’. 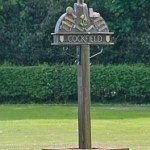 The location of the proposed development is outside of the Settlement Boundary and detached from existing development within the village of Cockfield. If approved, such creeping development would change the Cockfield street scene on its approach from Felsham and open countryside would be lost forever. This application is not in context with CS2, 11 and 18, now that Babergh and Mid-Suffolk DC can satisfy their 5 Year Land Supply. It is also difficult for the Parish Council to consider any planning application submitted with ‘All Matters Reserved’, without the benefit of a site plan or the provision of any details regarding number, type, scale or size of dwellings proposed. particularly around the Great Green is not considered adequate by the current property owners. c) ‘Drainage’ (2.6.1) states that the dwellings will be connected to the mains sewer, however the Parish Council does not believe that any of the adjacent properties are connected to a mains sewer. The Parish Council would therefore question the feasibility of this statement. d) ‘Flood Risk Assessment’ (2.7.1) states that the site is situated within Flood Zone 1 and not at risk of flooding. However, the site slopes towards the triangular green at the junction of the Cockfield/Felsham/Thorpe roads, which is notorious for flooding on the road between High Meadows Farm and the thatched house on the corner of this green. If surface water drainage is discharged to soakaways as stated in 2.6.1, the additional surface water run-off is likely to add to the prevailing water table level in the area, causing further problems. a) The height of the other dwellings on this site are out of context with Jupiter (the adjacent bungalow) and other dwellings in the near vicinity, and we would ask Babergh District Council to look at this. b) Drawing No. 17 1507 22 (Proposed Elevations) implies that there are areas of rendering relief to the mainly red brick façade, however this is not mentioned in the Application Form, Section 7 Materials. The Parish Council would support this attractive feature, which adds variety to the overall design of the development of 5 dwellings on the site. c) The Application Form, Section 11 – Assessment of Flood Risk, states that surface water will be disposed of through a sustainable drainage system. The Parish Council have previously raised a complaint about the disposal of surface water from the large detached property and the other two semi-detached properties on this site, as they discharge via a drain pipe projecting from under a neighbouring driveway, into a roadside ditch in Birds Lane. This ditch remained full of water for several weeks and as it is clearly not adequate to discharge surface water from the existing 3 No. dwellings on this site (throughout the recent extended period of hot weather), it will not be fit for purpose for 5 No. dwellings during the winter. The Parish Council has not yet received a response to its complaint, so is highlighting its concern over the surface water disposal provisions for these dwellings. d) The visibility splays need to be sufficient to minimise safety concerns for vehicles emerging from this development onto Chapel Road, due to the adjacent hedges. DC/18/01213 – Erection of 3 No. detached dwellings & enlargement of existing vehicular access. The Abbey, Bury Road, Cockfield. IP30 0LB. The Parish Council supports this application. DC/18/03293 – Planning Application. Extension to existing haulage yard and trailer wash facility. Loft Farm, Cross Green, Cockfield. IP30 0LJ. The Parish Council supports this application, subject to concerns over the height and extent of additional floodlighting and its impact on neighbouring properties. DC/18/03294 – Planning Application – Erection of extension to office. Loft Farm, Cross Green, Cockfield. IP30 0LJ. The Parish Council supports this application. DC/18/03638 – Planning Application. Erection of four dwellings. Land North Of 4 Hedgerow Cottage, Windsor Green, Cockfield, IP30 0LY. The application is broadly within the Built-Up Area Boundary, although the plot would ultimately extend this into the adjacent arable field. The development is modest and could be considered linear infill. The design and material are generally consistent with and sympathetic to the nearby properties and the overall locality. The proposal does not detract from the overall settlement context at Windsor Green and should not be viewed as isolated or unsustainable and in fact should be seen as a positive contribution. a) Concerns have been raised by the owners of Roundwood over the disposal of surface water drainage and the increased risk of flooding, if surface water from this development is discharged into the ditch, which drains into the pond at Roundwood. b) Highways have raised objections to the proposed visibility splays and the number of exits onto the highway, insisting on a reduction from one exit per dwelling to one communal exit. c) The Parish Council’s only concern over the design of the development is whether the height of the dwellings will be compatible with the surrounding street scene. DC/18/02911 – Submission of Details under Outline Planning Application – DC/17/03524 – Appearance, landscaping and scale for 5 No. dwellings plots 1-5. Hope House, Cross Green, Cockfield, Bury St Edmunds Suffolk IP30 0LG. Reserved Matters Have Been Approved. DC/18/03048 – Outline Planning Application (Access to be considered) – Erection of up to 5no. dwellings. Plough and Fleece Inn, Great Green, Cockfield, Bury St Edmunds Suffolk IP30 0HJ. Outline Planning Permission has been Refused. DC/18/03233 – Discharge of Conditions Application for B/16/01157 approved under APP/D3505/W/17/3170002-Condition 3 (Details of External Materials), Condition 4 (Boundary Treatment) and Condition 5 (Vehicular Access). Roundwood House, Windsor Green, Cockfield, Bury St Edmunds Suffolk IP30 0LY. Approved Conditions. DC/18/03253 – Planning Application – Erection of 2 No. dwellings. Site Adjacent to Jupiter, Great Green, Cockfield, Bury St Edmunds Suffolk IP30 0HQ. Planning Permission has been Granted. DC/18/01878 – Planning Application – Erection of agricultural storage building. Earls Hall Farmhouse, Earls Hall Road, Cockfield, Bury St Edmunds Suffolk IP30 0JD. Planning Application Refused. DC/18/02494 – Notification of Prior Approval Application under Part 3, Class Q (a) and (b) of the Town and Country Planning (General Permitted Development) Order 2015 – Change of use of agricultural building to dwelling. Little Close, Old Hall Lane, Cockfield, Bury St Edmunds Suffolk IP30 0LQ. Prior Approval has been given subject to conditions. 7.1 To receive a financial statement and report, including the latest position with the 2018-2019 Council budget. 7.2 To authorise payments as presented and to note income received. Cllr Morley to update the meeting on the progress of the two Parish Council Applications and the Village Management Committee Application. Clerk to update the meeting on progress with the transfer of land from Babergh District Council to Cockfield Parish Council. Cllr Brinkley to update the meeting regarding volunteers to undertake the painting of the kiosks and status of telephone kiosks on Great Green and Windsor Green. Cllr Morley to update the meeting on progress with the kerbing work at Cross Green. Clerk to update the meeting on progress with the installation of the Playground Signs at Great Green. Cllr Turner to update the meeting on the procurement and installation of a new ‘smiley face’ speed monitoring device. 15.2 Cllr Southgate to update the meeting on progress in undertaking a Parish Council Fire & Risk assessment on the Pavilion before the Pavilion is hired out. 15.3 All to agree actions needed to be undertaken by Pavilion Working Group to reduce Pavilion operating costs and to respond to outstanding Insurance issues. Cllr Turner to update the meeting on progress in determining the site for the defibrillator and Telephone Kiosk. Cllr Ruffell to update the meeting on progress in organising and promoting the ceremony. By Exception, to receive any reports from lead members on matters which need to be brought to the attention of the Council and to take actions appropriate. To consider the list of correspondence received and to agree any appropriate actions. 20. Matters to be brought to the attention of the Council either for information or for inclusion on the agenda of a future Ordinary Meeting. To note that the next Ordinary Meeting of the Parish Council is scheduled for Thursday 25 October in the Village Hall beginning at 7.30pm.